Those seven years have been fun - it's been fun meeting other foodbloggers from all over the world, it's been fun taking part in various foodblogging events. It's been educating and entertaining thinking more about what, how, and why we eat, being more reflexive about our dietary choices, eating habits and the food culture in general. 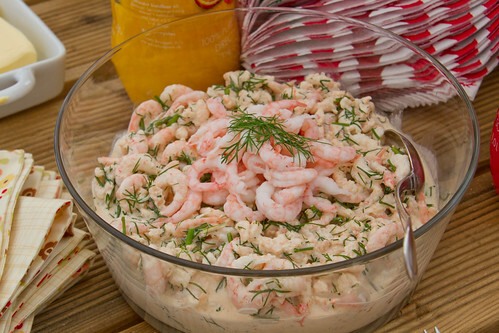 For today's recipe, I'll give you this Swedish shrimp salad, something that was offer on the recent Swedish buffet. Although I do cook and blog about dishes from all over the world, then I do feel most happy and confident when blogging about Estonian, other Nordic and possibly also Eastern European dishes. This is a very Nordic salad flavour-wise - fresh, herbal, light and very summery. You can serve it as a simple salad or perhaps on top of some buttered toast. * I prefer the ones in a light marinade or brine to the frozen ones, but both will do. Just make sure the netto weight after defrosting and draining is about 400 g.
If using frozen shrimps, then thoroughly defrost them (I take them from the freezer and put into the fridge on the previous night). Drain thoroughly, then squeeze gently to remove as much water as possible. If using shrimps in a brine/marinade, then simply drain them. Put couple of shrimps on the side, if you want to use them for garnish. 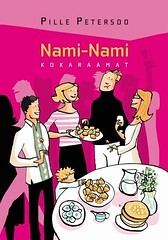 In a large bowl, mix mayonnaise and dill, season with lemon juice, paprika powder and pepper. Add the shrimps and stir gently, until combined. 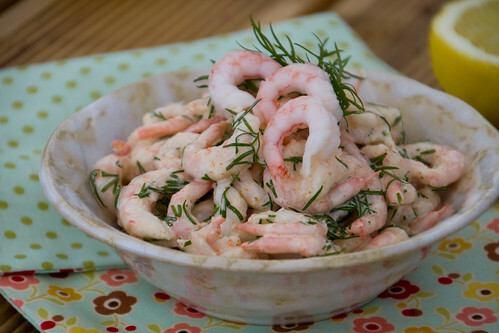 Transfer the salad into a serving bowl, garnish with some shrimps and dill. Serve at once, or cover with clingfilm and place into the fridge for an hour or two. happy blog anniversary! looking forward to more of your adventures! Congratulations on seven years! 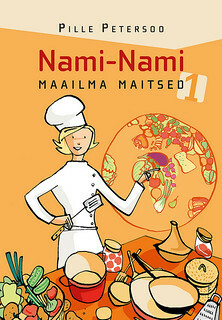 I have learned so much about Estonian cooking from reading your blog and trying the recipes. You've added richness to my cooking repertoire many times over. Congratulations on seven years of blogging (not to mention a great husband and two adorable kids!) I still remember when you were blogging from Scotland (with the black background on the blog!) Hope we will get to meet in person someday. Shrimp salad, yes please! Congratulations on seven years of yummy content. Looking forward to more recipies! Congratulations on seven years Pille. You have done so much in the seven years. A husband and two children is wonderful. congrats! and a great celebration recipe-simple, summery and tasty. Happy blog anniversary Pille! So happy to see you still going strong! :) Looking forward to the years to come!! Happe 7th blog anniversary;it is really a long time in the blog world! Happy Blog Anniversary, dear Pille! How easy it would be to sit myself down at your table, to eat, to talk, to laugh ... may there be many more!